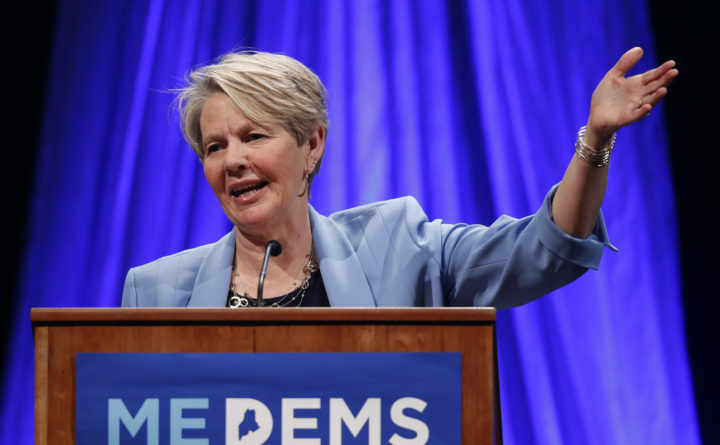 Gubernatorial candidate Betsy Sweet speaks at the Democratic convention, Saturday, May 19, 2018, in Lewiston, Maine. Democratic gubernatorial candidate Betsy Sweet has a long money trail in Augusta, rivaling some of the most prolific and powerful lobbyists in the state. She has brought in $762,500 to her firm, Moose Ridge Associates, since 2008, making her the 12th highest-paid lobbyist of the last decade, by Ethics Commission records. At the same time, she’s running with public funds to get the influence of big money out of politics. That’s just one of the apparent contradictions in her campaign: She’s also a spiritual counselor and vlogger who practices alternative medicine while lobbying for groups like the Maine Primary Care Association and the American Cancer Society. She’s a longtime Augusta lobbyist who doesn’t shy from being an “insider”; she asks to be judged by the clients she’s represented. Most are social service agencies. Sweet has been paid to advocate for funding for mental health programs, services for elderly Mainers, environmental protection and changes to the state’s medical marijuana rules. “I work to represent those clients and only take on clients whose mission I agree with,” Sweet said. And so, that list itself provides insight into both Sweet’s work and her beliefs about what should change in Augusta. While Sweet has made a career lobbying Maine lawmakers, she’s operated differently than her cohort of the state’s most prolific lobbyists. In the past decade, she’s sustained her Hallowell-based lobbying business on 24 relatively small-money clients, who pay a flat fee for her advocacy. It raises the question of how she ranks 12th based on disclosures to the Maine Ethics Commission. And, yet again, a somewhat unusual answer: She reports more than required, listing the entire flat fee paid to her firm. Lobbyists aren’t required to report the fee they charge for reserving their services, called a retainer. Lobbyists are only required by law to report the time for which they’re paid to “communicate directly” or prepare communications with elected officials, and only when that communication intends to influence a legislative action or veto. But Sweet said her firm lists everything her clients pay. Not all of the money reported in her name lands in her pocket, she said. The money has been split with three or four independent contractors, depending on the session, who work on bills as “associate” lobbyists. Increasingly, that’s a role Sweet’s taken on as she steps back from the business. In the previous Legislature, she was listed as an “associate” lobbyist on about as many bills as she was the “primary” lobbyist. In the last Legislature, she listed just one client. If elected, she said she’d close up shop. Her largest and steadiest client is the Behavioral Health Community Collaborative, a collection of agencies providing mental health services, including Sweetser, The Opportunity Alliance and Spurwink. The collaborative was her only direct client during the most recent legislative session. For those social services groups, most of Sweet’s work has focused on health care spending in the biennial budgets during Gov. Paul LePage’s administration. For her top client, she worked on three biennial budgets. During LePage’s first term, with freshly minted Republican majorities in the House and Senate, she represented 10 different social service organizations lobbying on that budget. They included the AARP, Disability Rights Maine, the Maine Primary Care Association and the Maine Coalition to End Domestic Violence. LePage staked out domestic violence prevention as a top priority of his administration, which Sweet applauded, but she said there were few changes in policy or funding. To a lesser degree, Sweet has represented environmental groups, such as the Maine League of Conservation Voters, and medical marijuana advocates with the Maine Association of Dispensary Operators. For the medical marijuana group, Sweet worked on 24 bills over two sessions, but Sweet said she got out of that advocacy when retail marijuana legalization came on the horizon. “We all felt very strongly that we wanted to maintain the medical program and that’s what we were trying to make sure was possible in the two years that we were representing them,” Sweet said. Outside of her lobbying work, Sweet has taken issue with medical approaches that turn first to prescription drugs as a solution. The National Institutes of Health said that Reiki “hasn’t been shown to have any harmful effects,” but noted that there’s little research into its overall effectiveness either. Sweet said she agrees with the NIH that Reiki and other alternative medicine treatments should not replace conventional Western medicine. Sweet said she’s open to the idea that acupuncture or other alternative treatments could play a role in addressing issues ranging from post-traumatic stress in combat veterans to drug addiction. That kind of openness, she said, sets her apart in the Democratic field. “[Democratic U.S. Sen.] George Mitchell said we have two ears and one mouth for a reason and I’ve never forgotten that,” Sweet said.